My wife already has about twenty infertility books. Can’t I just read one of those? You can… but you probably won’t. Most infertility books are overly complex and fairly boring. Also, because they’re written with the woman in mind, very little of the information will be pertinent to a man. 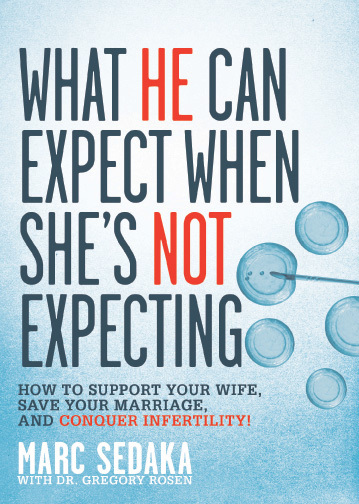 “What He Can Expect When She’s Not Expecting” is like the Cliff Notes of all those books rolled into one. No technical mumbo-jumbo, no gross diagrams of the female anatomy. And better still, it won’t just tell you what you and your wife will be going through, but will also explain – in detail – how you, the husband, can deal with it! Is this book only for heterosexual couples? What about gay couples or single parents-to-be? Since much of the book is garnered from my own experiences, it is written from the perspective of a married, heterosexual male. However, for better or worse, infertility doesn’t discriminate. So anything I talk about – be it the tests, the procedures, and even much the relationship dynamics – apply as much to a 30 year old single gay man as they do a 45 year old married husband. What if my wife and I just started trying (unsuccessfully) to conceive? Is it too early to buy this book? Not at all. Realizing there’s a problem is, in many ways, the most crucial step you’re ever going to make and, for many couples, it’s also the most stressful. That’s why I devote the entire first section of the book to this very topic. Here you’ll learn what the warning signs of infertility are, when you should take action, and how to move forward even if you and your wife don’t see eye to eye. So is this a medical book? A humor book? A self-help guide? Yes, yes, and yes. At its heart, it’s a medical self-help guide that’s presented in as light-hearted a fashion as possible. Look, there’s nothing inherently funny about infertility. But as my wife and I can attest, if you don’t at least try to find the humor in it some way, some how, you’ll just drive yourself crazy. So finding that bit of humor is, in many ways, what I strove to accomplish with this book. How are you qualified to write a medical book if you’re not a doctor? I’m not. That’s why I’ve enlisted the help of world renowned fertility expert, Dr. Gregory Rosen, to not only check my facts, but to contribute his expertise whenever possible. I mean, honestly, would a layman like me ever use a word like Hysterosalpingogram without first double-checking it with a doctor? I think not. Does the book at least have a happy ending? I’m proud to say it does. After ten IVFs (that’s In Vitro Fertilizations for all you newbie’s) my wife and I were finally blessed with twin girls through a gestational surrogate (basically a womb for rent) and then, two years later, had a son completely naturally! As I stress many times in the book, you and your wife will become parents. It may not happen as early as you thought, or even in the way you thought it would, but if your resolve is strong enough, it will happen. That much I can promise you.